You will be thrilled by the number of Big Island beaches that are pristine which offer a wide variety of watersport activities, photograph opportunities and sunny days on the beach for families. You will also be amazed at how many different colors of sand which range from golden to white to black to green. You can visit South Point and Green Sand Beach which will have you at the most southern point in the United States. Black sand beaches can be found at Punal'u and at 49 Black Sand Beach. Beautiful white sands drape the shorelines at Hapuna Beach, Anaeho'omalu Bay and snorkeling is superb at Honaunau Bay. You can also spot an enormous amount of marine life such as hawksbill as well as green sea turtles. No matter what you are looking for in a beach, you will find it on the Big Island. 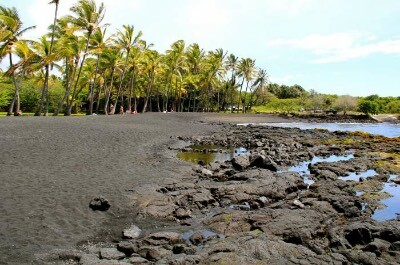 One of the best Big Island beaches to visit for black sands and a relaxing day of fun in the sun is Punalu'u Black Sand Beach Park. Located on the southeastern shoreline of the island along the Kau Coast, Punalu'u Black Sand Beach Park is a magical place to view incredible marine life as well as walk along the black sandy beach. The shoreline at Punalu'u Black Sand Beach Park has nice palm trees for shade and of course the major attraction here is the gorgeous jet black sand. The swimming is only safe if you stay close to shore and there is a shallow freshwater pool that is good for wading. Another major activity here is watching for hawkbill and green sea turtles which frequent the area and you are required to stay at least 15-feet from the turtles. Many visitors have taken black rocks as well as sand from this beach but it is prohibited and locals believe taking the black substances will lead to bad luck. You can access Punalu'u Black Sand Beach Park from Highway 11 between mile markers 55 and 56. There are picnic tables but not much more for facilities. In the past Honaunau Bay was a strong hold for Hawaiian chiefs and now Honaunau Bay is one of the best Big Island beaches for snorkeling. 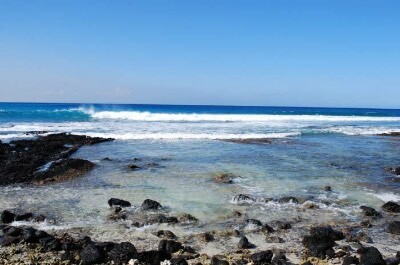 Located on the southwestern shoreline of the island near Pu'uhonua O Honaunau Park, Honaunau Bay is also known as Two Steps because of the natural two step lava flow that helps makes entry into the water easy. Honaunau Bay is a snorkeler's paradise with shallow water, sea turtles and lots of tropical fish. If you want your children to learn how to snorkel while in Hawaii, Honaunau Bay is ideal for novices. Scuba as well as free divers can find sharp drop-offs of up to 100-feet to explore and you will be amazed at the brightly colored underwater world that exists at Honaunau Bay. You can take a little and explore the 180-acre Pu'uhonua O Honaunau Park which at one time was a prisoner of war camp and is considered a top historical as well as cultural park on the Kona. There are facilities such as restaurants, showers and watersport rental shops. 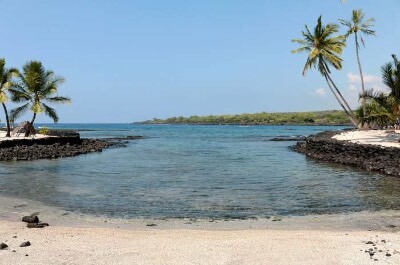 Often voted one of the best Big Island beach areas, the Anaeho'omalu Bay is also known as A-Bay to the locals and is a perfect place for a family to spend a full day. Located on the western shoreline of the island near Waikoloa, Anaeho'omalu Bay has gorgeous white sands with swaying palm trees for shade. Anaeho'omalu Bay is an ideal spot with an offshore coral reef for protection that provides calm waters for a plethora of watersport activities such as snorkeling, swimming, standup paddleboarding, scuba diving as well as kitesurfing and windsurfing. The white sand is beautiful and ideal for making sandcastles near the water. You will find plenty of marine life at Anaeho'omalu Bay which includes spinner dolphins and sea turtles who often lounge on the sandy shoreline. There are hiking trails, ancient fishponds and lots of tide pools to explore in the area. Families will enjoy a full array of services from watersport equipment rentals to picnic tables to restrooms to showers which help make for a great day at the beach. If you want to travel to a truly unique Big Island beach as well as visit the most southern point of the entire United States, then you need to go to South Point and Green Sand Beach. 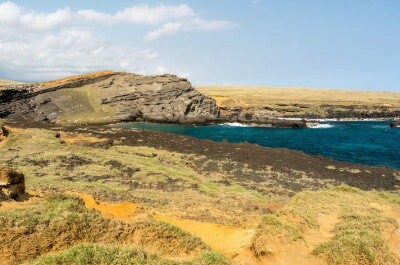 Located on the most southern point of the island, Green Sand Beach is also known as Papakolea Beach and the green sand has been created by a cinder cone offshore that has a huge deposit of olivine which has gradually been eroded to sand by the Pacific Ocean. Access to South Point and Green Sand Beach is off of Highway 11 between mile markers 69 and 70. Once you reach the small harbor you will find parking and you can easily walk to South Point. If you are going to Green Sand Beach then you have 3-mile hike ahead of you through stunning scenery while you navigate the trail over the cliffs. When you reach Green Sand Beach you will marvel at the color of the green sand that is stark contrast to surrounding scenery. The swimming at Green Sand Beach is good when the waters are calm but not advised when the ocean is rough. At times the whole beach area can be submerged so check for high tide before you set out for your visit. This is a whole day affair so come prepared as there are no facilities at Green Sand Beach. 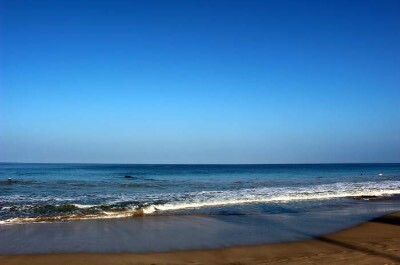 Hapuna Beach is one of the easiest accessed Big Island beaches and boasts gorgeous white sands and beautiful calm waters. Located on the northwest coastline of the island near the Hapuna Beach Princess Hotel, Hapuna Beach has a half mile stretch of white sands that are 200-feet wide at points along the shoreline. You can access Hapuna Beach off of Highway 19 at mile marker 69 and unlike Mauna Kea Beach you do not need to receive a beach pass as most of Hapuna Beach can be accessed from public areas. Once at Hapuna Beach you will be pleased with the soft sands, the grassy landscaped areas and calm waters that are ideal for swimming and snorkeling is best on the north end of the beach near the cliffs. Hapuna Beach is perfect for families who are looking to spend a full day of fun in the sun and surf. There is plenty of space to play Frisbee, volleyball and soccer as well as build a big sand castle. The Three Frogs Café is located onsite for food as well as drink and there are watersport equipment rentals. Hapuna Beach has facilities such as barbeque grills, picnic tables, showers and restrooms. When you are searching for Big Island beach that offers plenty of activities like swimming, hiking and nature watching, then you need to visit Manini'owali Beach. Located on the northwestern shoreline of the island within the boundaries of Kekaha Kai State Park, Manini'owali Beach overlooks the Kua Bay and has gorgeous sands that attract plenty of watersport enthusiasts. Manini'owali Beach can be accessed off of Highway 19 at mile marker 88. Manini'owali Beach is perfect for swimming and snorkeling in the summer months and surfers as well as bodyboarders take advantage of the offshore breaks during the winter. Marine life is abundant at Manini'owali Beach with sea turtles and spinner dolphins swimming off the coastline. The beach area is a mixture of ancient lava flows and there is not much shade available. There are several hiking trails at the beach which will take you to Puialoa Point which overlooks Kahoiawa Bay. Manini'owali Beach has facilities such as picnic tables, showers and restrooms. 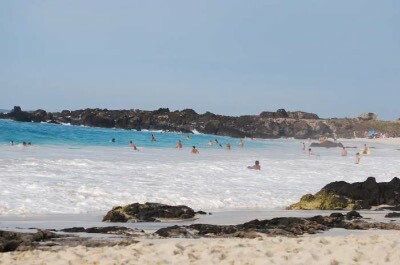 If you are looking for a beautiful white sand beach that is great for families, then the Big Island beach you should visit is the Mauna Kea Beach, also known as Kauna'oa Beach. Located on the northwestern shoreline of the island in front of the Mauna Kea Beach Hotel, the Mauna Kea Beach is a beautiful half mile stretch of gorgeous white sands surrounded by palm trees that overlooks Kauna'oa Bay. To access Mauna Kea Beach you must drive on Highway 19 until you reach mile marker 68 where you will need to ask the guard for a beach Pass. Once at Mauna Kea Beach you can lounge on the incredible white sands, swim and there is good snorkeling on the southern edge as well as an additional coral reef on the northern edge. There is a nice coastal trail that connects Mauna Kea Beach with Hapuna Beach to the south. If the parking lot is full at Mauna Kea Beach Hapuna Beach is a great option since you are already in the neighborhood. Another interesting thing about Mauna Kea Beach is that in the evening the Mauna Kea Beach Hotel turns on flood lights which attract numerous manta rays into the area which you can snorkel and swim around. You can access the hotel for food and drink options onsite. The hotel also maintains public restrooms and showers for beach goers. 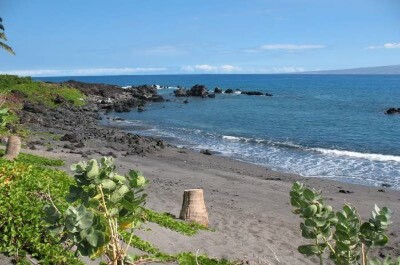 If you want to see the only black sand beach that is within the Kohala Coast, then 49 Black Sand Beach is the perfect Big Island beach for you to visit. Located on the northwestern shoreline of the island near Mauna Lani Beach Resort, the 49 Black Sand Beach is situated overlooking Honokaope Bay and offers a secluded place to relax under the sun. The 49 Black Sand Beach can be accessed by exiting the Queen K Highway towards Mauna Lani Beach Resort and once you are at the guard shack you must ask for a beach pass. Once at the 49 Black Sand Beach you can enjoy a wide variety of watersports from swimming to snorkeling to windsurfing or just lounge on the incredible black sand. The black sands were created by a 19th century lava flow some 50-miles away and the fine lava grains have been deposited over the years along this stretch of coastline. There is a great hiking trail that leads you over the lava cliffs and overlooks Honokaope Bay as well as Iliilinaehehe Bay. There are facilities such as restrooms and showers on 49 Black Sand Beach. One of the prettiest Big Island beaches is Anaeho'omalu Beach, also known as A-Bay, where you can spend a whole day relaxing on soft white sand. 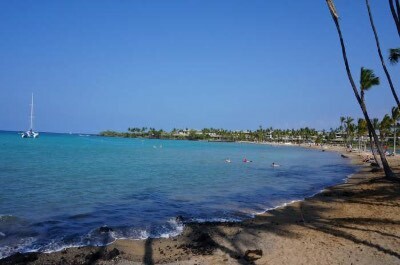 Located on the western shoreline of the island, Anaeho'omalu Beach is situated near Waikoloa and overlooks Anaeho'omalu Bay which is protected by an offshore coral reef. Anaeho'omalu Beach is ideal for a variety of watersport activities including swimming, snorkeling, standup padlleboarding, scuba diving, surfing and windsurfing. The beach area also features a coconut palm grove, tide pools and there are two ancient fishponds directly behind the beach. You can enjoy a leisurely 2-mile hike on the King's Trail which will take you to a 2-acre historical park where you can learn about the petroglyphs, ancient artifacts and rock shelters that are present. If you want to add an activity while visiting Anaeho'omula Beach, then stop at Dolphin Quest where the family can swim with dolphins. There are facilities at the beach like showers, restrooms, picnic tables and watersport equipment rentals. 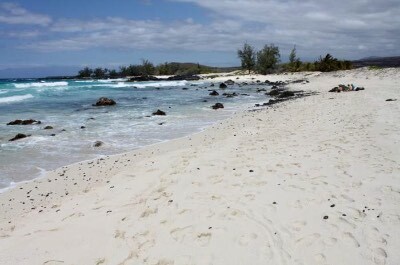 If you are searching for a secluded Big Island beach and don't mind a short walk or want to be adventurous in your four wheel drive vehicle, then you need to go to Makalawena. Located on the western shoreline of the island near Kekaha Kai State Park, Makalawena Beach is situated on Pu'u Ali'i Bay and features white sands, black lava rock formations as well as superb sand dunes. The best way to access Makalawena Beach is by driving on Highway 19 until you reach Kekaha Kai State Park between mile markers 90 and 91. From here you will drive 1.5-miles on a dirt road until you reach a parking area where you will set out on foot for a 20-minute hike passing Mahai'ula Beach. Once you are at Makalawena Beach you will be thrilled with the pristine conditions of the white sand, tide pools and the beautiful sand dunes. The swimming as well as snorkeling is very good at Makalawena Beach and you can find a perfect spot to lounge with sufficient trees for shade. There are picnic tables but no other facilities located at Makalawena Big Island beach.